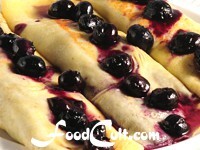 Crepes &amp; Pancakes - Free, Easy Recipes @ FoodCult.com - A Place for Galganov's Recipes and More - Food Matters! We like to mix up a big batch of crepe batter and make our crepes in advance - filling a few at a time as our tastes dictate. In some cases such as making cheese blintzes or croquette (Polish crepes) we'll make up a big batch of crepes and roll up lots at a time, freezing the finished blintzes or croquettes for later use. While crepes are usually enhanced with something rolled in and something ... or something else drizzled on top, they can be simple--rolled and dusted with a bit of cinammon sugar. Pancakes are typically raised - getting their fluffiness from baking power although they can be yeast raised--something not uncommon with buttermilk pancakes. Pancakes are not really dessert food but they are fantastic as a breakfast, brunch component or midnight snack. They can be prepared with any number of added ingredients for flavour and while best enjoyed around here bathed with butter and maple syrup we've seen them eaten salted or spread with jams or preserves.